Comlete analysis of Geopolitics with recent one year current updates. 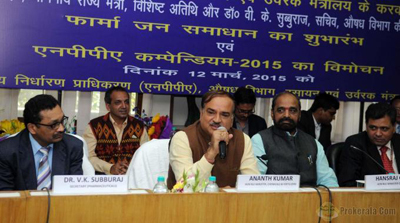 Pharma Jan Samadhan Scheme was recently launched by the Union Minister of Chemicals & Fertilizers. It is a web enabled system for redressal of consumers’ grievances relating to pricing and availability of medicines. It was created by National Pharmaceutical Pricing Authority (NPPA). The ‘Pharma Jan Samadhan’ scheme has put in place a speedy and effective complaint redressal system with respect to availability and pricing of medicines. It would serve as a robust e-governance tool for protection of consumers’ interests through effective implementation of the Drugs (Price Control) Order 2013. The International Monetary Fund (IMF) has forecasted that India will grow 7.5% in 2015-16, up from 7.2% in the current year. The report stressed the urgency of certain key reforms, including the bottlenecks in the energy, mining and power sectors; infrastructure gaps, land acquisition processes and environmental clearances. The report says that India’s vulnerabilities have receded more than those of most emerging markets and sentiment has been revived.